Here are a few agronomic issues local farmers have had recently. When one person has a question or problem, chances are that many others do as well. ‘Pop-up’ fertilizer seems to be increasingly popular with those who grow corn. There is great irony in the name, since emergence is not faster when it is used, and it is often delayed by 1-2 days, due to the effects of the salts in the fertilizer. In light of this fact, it seems more appropriate to just call it ‘seed-placed’ fertilizer. What seed-placed fertilizer can do is improve early season growth, but increased yields at the end of the season will be experienced less consistently than if fertilizer is banded two inches below and to the side of the seed. 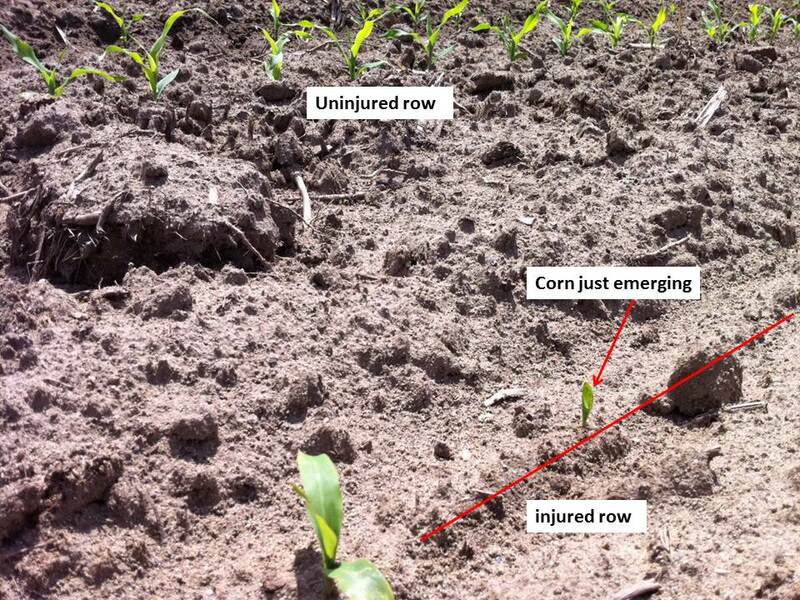 The risks of pop-up fertilizer were highlighted yesterday in fields that had been planted with a four-row planter. The cool wet spring had caused somewhat delayed emergence, but two adjacent rows had come up beautifully, probably emerging in 6-8 days. The other two rows had weak seedlings, most of which came up after 12-14 days, with some still not emerged. We investigated seeding depth, down-pressure differences, mechanical damage to the seed, but could not pin the problem on any of those possibilities. The light came on for both the farmer and myself when, in the course of discussion and digging seedlings, the farmer mentioned that the pop-up fertilizer had gone on heavier than had been intended. It seemed that something had caused more fertilizer to be applied from one side of the planter than the other. The seedlings in the row where emergence had been delayed had softer seminal roots (the roots coming off of the seed), some of which were approaching a tan color, and a softer seed attached to the seedling. There were some seeds that never germinated. The farmer had an appropriate target rate for seed-placed fertilizer, but something in the fertilizer application system was not working properly. In general, no more than 10-12 pounds of nitrogen + potassium (total) should be placed with the seed in the furrow, and even this can cause significant seeding stress. 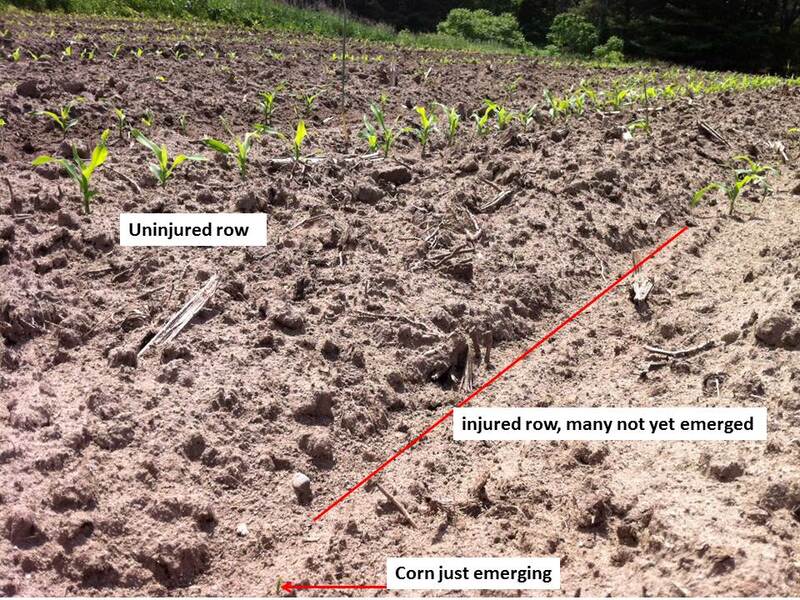 One final consideration: fertilizer injury coupled with cool/wet soils and the delayed emergence can make the corn seedlings more susceptible to various fungal pathogens that can cause ‘damping off’ and/or generally unthrifty seedlings. Given the circumstances, replanting this field is not advisable, but it is very likely that the differences between the rows will be visible even at harvest. Hoeft, R.G., Nafziger, E.E., Johnson, R.R., and S. R. Aldrich. 2000. Modern Corn and Soybean Production. MCPS Publications, Champaign, IL. Bur cucumber is a weed that farmers in the northeast report to be an increasing problem in their fields. The two-leaf stage of the seedlings look very much like squash plants, but the first true leaves look somewhat like cucumber leaves. When setting fruit, this plant will have clusters of 3-10 spiny green fruit. A similar plant, wild cucumber, generally will have one fruit per node. 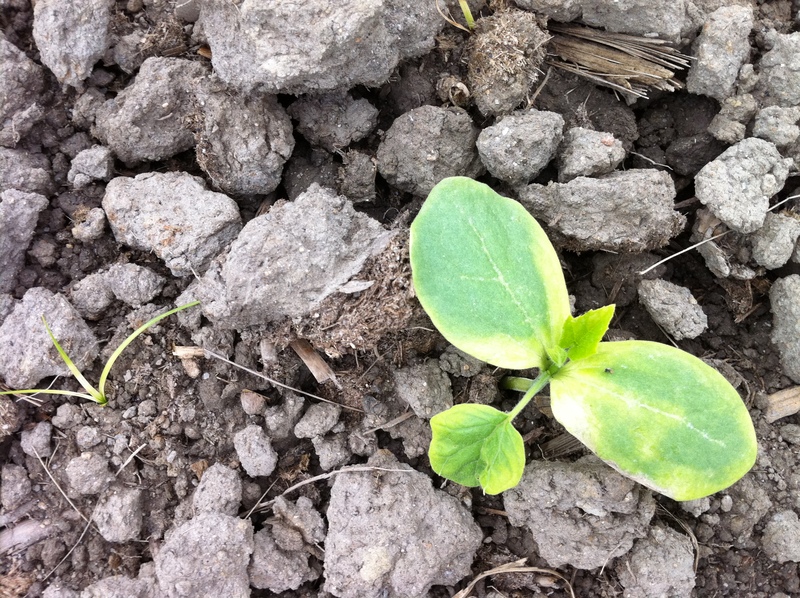 time, so post-emergence herbicide applications can easily miss later emerging plants. 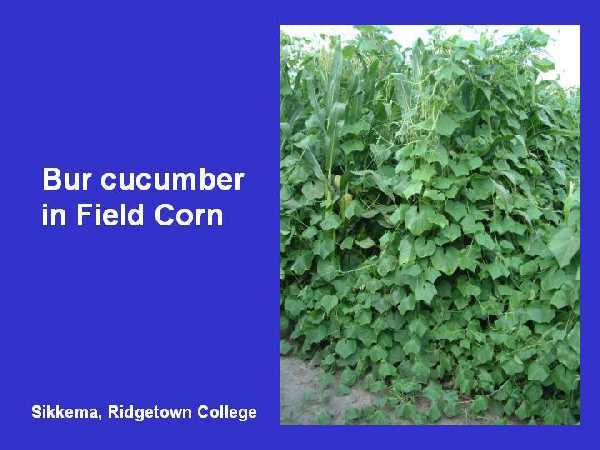 Research from Ontario found that the most effective herbicide combination for bur cucumber was bromoxynil (e.g., Buctril) plus atrazine, but this only achieved 85% control. Two applications of glyphosate in soybeans achieved the same level of control. While some farmers indicate that the presence of this weed in their fields is steadily increasing, it is unclear how problematic this weed will become in the near future. The good news is that harvesting the corn crop for silage will go a long way toward reducing the amount of seed for the following year. While the seeds can persist for long periods of time in the soil, rotating to forage crops where multiple cuts are taken should help reduce the population of this weed in crop fields. Farmers who produce organic corn rely on a combination of livestock manure and “green manure” to provide the nitrogen necessary to get a decent yield. Because organic standards do not allow for the use of synthetic fungicides and insecticides, seedcorn maggots and wireworms can often be a problem. Because the season does not always go the way we would like, it is not uncommon for organic farmers to plow down their green manure (an old pasture, hay field, fallow land, or a stand of clover) and want to plant almost immediately. The problem with this strategy is not immediately obvious, but the decomposing plant material is very attractive to the seedcorn maggot fly. These flies lay eggs in areas where there is a lot of relatively fresh decomposing plant material. It has always been surprising to me how those little maggots can find the corn seeds so easily. When they do, they eat a hole in the seed. 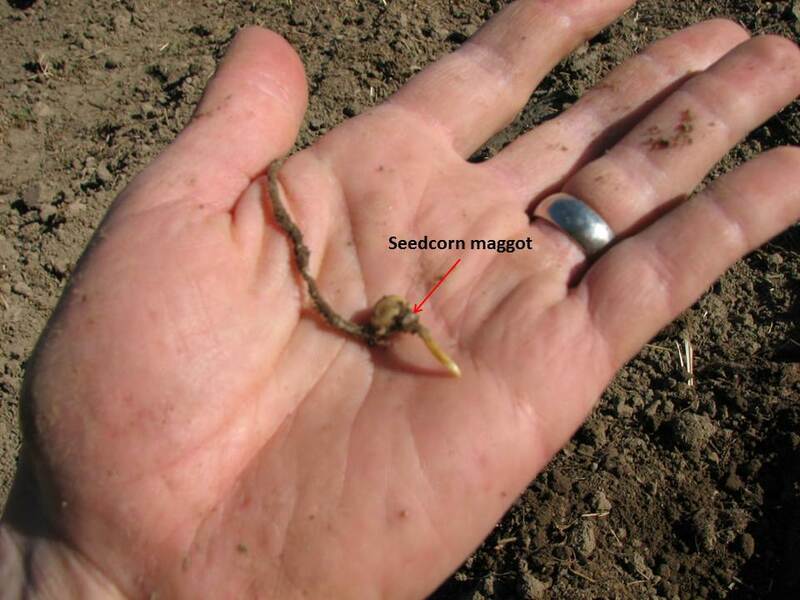 Aside from the easy living this affords the maggot and the usually fatal physical damage to the seed, soil pathogens quickly capitalize on the opportunity to invade the seed as well. In extreme circumstances, replanting is necessary. The best solution is to prevent the problem by waiting 14-21 days from the time the vegetation is initially plowed into the soil until you plant (realizing that this is pushing the limits of practicality). Like most IPM practices, this strategy will greatly reduce the number of seeds lost to the seedcorn maggot, but it will not eliminate them. Most seeds used by conventional (non-organic) farmers have seed-applied insecticides that will protect against seedcorn maggots and other seed-damaging insects.